Preparing the coloured jelly (agar agar) first, the only natural colour extract here is the blue from dried bluepea flower! Steep bluepea flower in 200ml water for 15 mins. Strain liquid and discard flowers. Combine liquid with 30gm sugar and 1 tsp agar agar powder and bring to boil for 2 mins. Pour mixture into a small container. Cool completely before chilling. Bring the balanced 600ml water to boil. Add in remaining 90gm sugar and 3 tsp agar agar powder and cook for 2 mins. Remove from heat. Divide mixture into 3 equal portions and add in red, green and orange colours respectively. Pour into individual containers and leave to set before chilling. Cut the stained glass jelly into small cubes and gently toss to distribute the coloured jelly evenly and set aside in fridge. After the coloured jelly had set, cut them into small cubes and ready to proceed in preparing the condensed milk jelly. Keep them chilled while preparing the milk jelly. Combine pandan leaves and water in a pot and bring to boil. Add in agar agar powder and cook for 2 mins. Add in condensed milk and stir evenly. Turn off heat. Discard pandan leaves. Ladle a scoop of milk mixture into a 7" square pan. After it is semi-set, gently sprinkle in a layer of stained glass jelly over, pour in some milk agar agar mixture. Layer in more stained glass jelly and milk mixture. 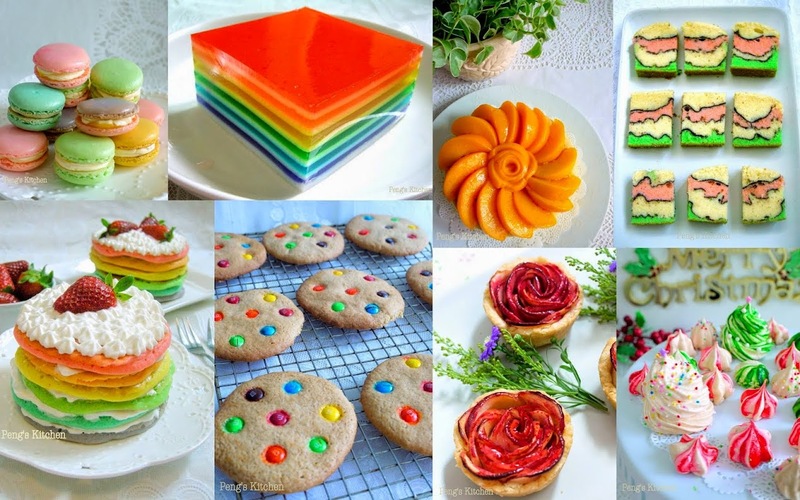 Make sure the last layer of coloured jelly is well submerged without protruding out. Set in room temperature before chilling. Chill completely before serving. The perfect dessert for snacking! Looks so yummy!